This is a spicy lentil salad I’ve dreamed about for a few years – since the first day I saw it at a large salad bar. Love at very first sight. Since then I’ve been trying to recreate that spicy lentil salad, but I couldn’t figure out how to make those lentils. I know how to bring lentils to a boil and cook them, I am not an idiot. But the salads I would make always turned bland and awful. So awful that I had to cook those salads again and turn them into a stir fry to make them edible. After years of research and sleepless nights, I figured: the lentils have to be flavored before they get into the salad, while they’re still cooking. And I was right. Last time I shared a recipe for basic spicy lentils to use in wraps and salads and this is the salad I made with those. It’s spicy, satisfying and simply awesome. It does take some time for preparation, because you have to make the lentils first. But if you make a big batch of lentils, you can use them in other dishes as well – simply double the ingredients here. 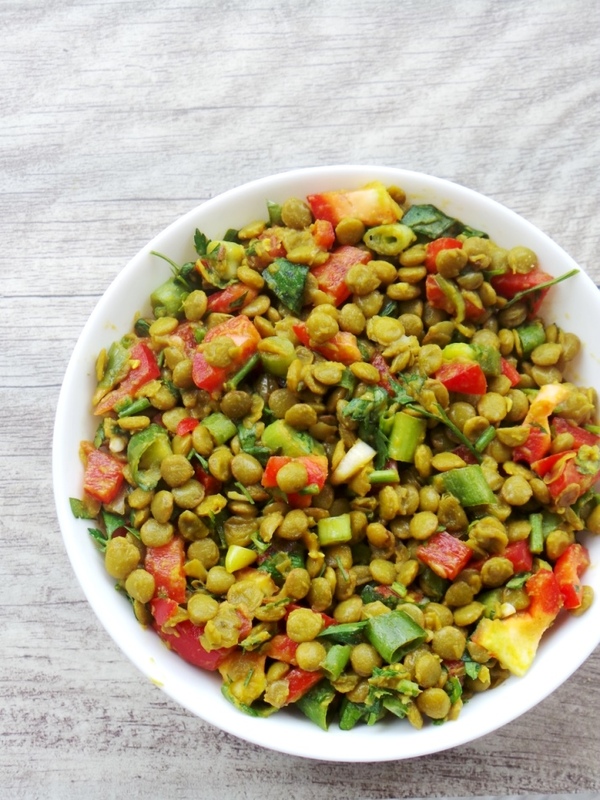 When you have the lentils this salad is made in less than 10 minutes. And all that while being so incredibly tasty. I call this a dream come true. A healthy spicy vegan and gluten-free salad that you can have for lunch, dinner or also as a side. Put the lentils in a large salad bowl. If you haven’t done it, remove the little garlic clove you cooked the lentils with. Add the rest of the vegetables – chopped peppers, onions, parsley, basil. Add olive oil and lime juice. Mix everything well. If needed add a little salt, but the lentils should actually be seasoned already. Enjoy! Additionally you can add cherry tomatoes, arugula or spinach or some roasted vegetables. OOOhhh and avocado would be really great! Wonder how I didn’t put avocado in there. What was I thinking? Next time. Once you have the base right (those lentils), you can’t really do wrong. Enjoy and have a great weekend! Come back next Monday for another recipe with those lentils that I’m sure will be loved by the whole nation of Spain (and the entire world).